McArthurGlen’s Ashford Designer Outlet is located in Kent, known as the ‘Garden of England’. The centre’s claim to fame is its designer, Lord Richard Rogers who is architect of the Millennium Dome. You’ll recognise the Outlet by the stunning McArthurGlen white tents. Close to Dover and the English Channel, lots of visitors come through this area. The Outlet opened in March 2000 and there are over 80 popular designer and high street brands including Ben Sherman, Gap, Polo Ralph Lauren, Tommy Hilfiger, Calvin Klein, Ted Baker at discounts of up to 60%. Ashford Designer Outlet is in Ashford, in the south-east of England. It is one of the five towns known as the Heart of Kent. So you can spend time discovering Ashford’s history as well as those of the other four namely Maidstone, Tonbridge, Sevenoaks and Royal Tunbridge Wells. The area surrounding Ashford Designer Outlet is famous for its gardens, tranquil countryside, hop gardens, oast houses, picturesque villages and historic buildings, all of which give this part of Kent its own unique flavour. Nearby attractions include Leeds Castle set in 500 acres of beautiful parkland and the Dover to Calais ferry crossing. Ashford Designer Outlet is conveniently located near Ashford town centre, a few minutes’ drive from Junction 10 of the M20, only one hour south of London. It is also close to the Eurostar International station which is a great plus. Local buses operated by Stagecoach run every 15 minutes between Ashford town centre and Ashford Designer Outlet. Look out for the bus marked Ashford Designer Outlet. For further information contact Stagecoach on Telephone +44 (0) 870 608 2 608. National Express run coaches to Ashford. For details telephone National Express on +44 (0) 8705 80 80 80 or visit www.nationalexpress.com. Ashford International is served by South Eastern Trains with trains from Charing Cross, London Bridge, Waterloo, Victoria and the South Coast. A shuttle bus service is available outside the domestic entrance. This costs around 50p each way. Alternatively, the centre is a five minute walk from the station. You can travel to Paris, Lille and Belgium from Ashford International Station. See eurostar.com or telephone +44 (0) 8705 186 186. Take the M20 motorway to Junction 10. Follow signs to ‘International Station’ and ‘Designer Outlet Centre’. 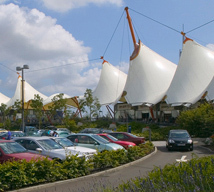 Ashford Designer Outlet has 1,450 car parking spaces, however charges apply.